The controversy surrounding the New York Public Library's Central Library Plan recently gained steam when the wonderful Humans of New York caught Matthew Zadrozny, an eloquent CLP critic, outside the library eating chicken. Like many other people, this was my first exposure to the issue. I lean towards the position of Zadrozny, the Committee to Save the New York Public Library, Citizens Defending Libraries, and others in opposing the CLP. But the CLP does have some merits. Regardless, what is most important is that the plan receives the educated public debate it deserves -- debate that has scarcely yet occurred. Public libraries should be a focal point for educated public debate. Indeed, public libraries are a uniquely important institution for democracy. They give every citizen the opportunity to educate themselves, regardless of their age, wealth or educational background. With this education, citizens can advance their own lives and become informed participants in public debates. 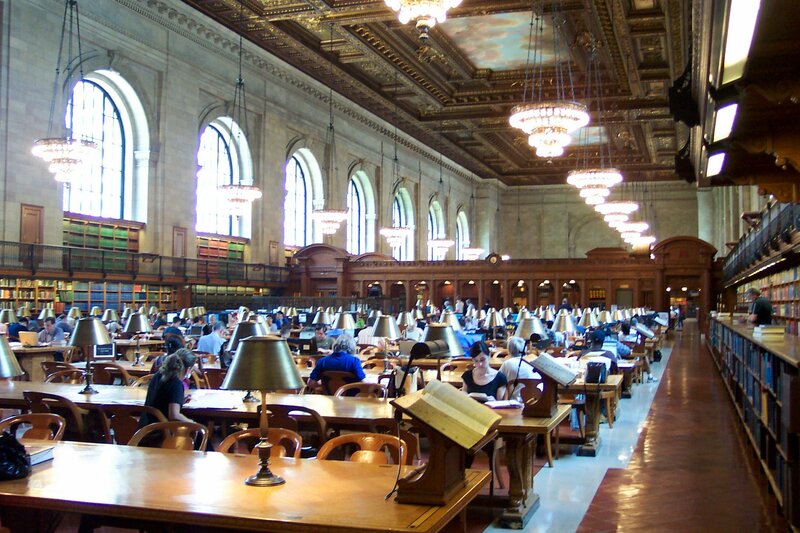 NYPL is one of the largest and most successful public library systems in the world. It is deeply unfortunate that NYPL has pursued a major reconfiguration with a minimum of public debate. Fortunately, there is still time for the debate this plan deserves, and opportunity for city government to insist on it. The essence of the CLP is to sell off two libraries, the mid-Manhattan and the science, industry, and business library, and consolidate their functions into a reconfigured main branch. The reconfiguration would be expensive, but NYPL would save money over the long run by only operating one library instead of three. The main branch would lose space for its research book collection while gaining a collection of circulating books and a broader user base. Overall, this set of changes would dramatically reshape NYPL. As an independent scholar living in New York whose research specialty is public policy, the plan hits me on both personal and intellectual levels. I use all three of the affected libraries. The main branch's research collection is especially valuable for me. It permits me to do research at a high level without being part of a university. I am an affiliate scholar of the Center for Research on Environmental Decisions at Columbia University, though this position does not give me library access. Unlike university libraries in other cities, I cannot even walk inside of Columbia's main library unless I pay them $500 per year. For an independent researcher, NYPL's research collection is a major benefit of living in New York City. The CLP would affect researchers like me in several ways. An upside is that the main branch would have longer hours. I would certainly enjoy that. A downside is that more research books would be relocated to NYPL's offsite storage facility in New Jersey. For these books, we would have to plan our reading further in advance, impeding scholarship. While some lament the loss of the main branch's historic research stacks, the new design for this space sounds architecturally very promising to me. A Vanity Fair article describes a grand open atrium with views of Bryant Park and other attractive features. We are envisioning something that doesn't exist anywhere else in the world. We are combining a great research library and a huge circulating library. We want everyone from the unemployed to the Nobel laureate. If this building works, it will lead the school kids who come here to aspire to what the Nobel laureate is doing. Regular (non-research) users would also be affected, and not just by having the honor of watching people like me read research books. I reckon us researchers are not actually all that much to look at. Perhaps the library would host programs in which we speak with school kids or other library users. I would gladly participate. But such programs could occur in existing library space. No, the biggest impact would be relocation to a different library. Closing SIBL means no more library near the Empire State Building. The mid-Manhattan is across the street from the main branch, not a significant geographic difference. NYPL claims the circulating book collection will not be affected, though this claim has been contested. The Main Reading Room, where researchers like me sometimes read books. Source: Wikimedia Commons. Much of the plan comes down to money. Finances are clearly a motivator for NYPL. Selling the mid-Manhattan and the science, industry, and business library could generate $100 million each. In addition, NYPL would save about $7 million per year in operating expenses by consolidating these two libraries into the iconic main branch. Main branch construction would cost an estimated $300 million. With $200 million from real estate sales and $150 million from the city, NYPL would approximately break even on construction and while saving $7 million per year on an ongoing basis. For all the financial details, the best analysis I've been able to find is a blog post by CLP critic Caleb Crain, which suggests that other options may also be financially viable, though NYPL does not make enough data available for a careful comparison. Unfortunately, there is reason to believe that the finances may not work out as well as NYPL plans. Selling SIBL and the mid-Manhattan could bring in less than anticipated. This was NYPL's experience with its recent sale of the Donnell Library, which raised only $59 million. And the construction could cost more than $300 million. This has been the experience of a great many construction projects, from the Big Dig on down. The phenomenon of underestimating project costs is so widespread that social scientists have given it a name, the planning fallacy. Underestimation is especially likely when those doing the estimating have strategic incentive to give low estimates, to make the project seem more attractive. The city should be very wary of cost underestimation, whether it is unintentional or strategic. All the more reason for an educated public debate. But here is an important area where CLP advocates and critics tend to agree: Both would like to see greater city funding for NYPL. NYPL is a private nonprofit that gets significant city funding. If it had more funding, it could better afford to keep more libraries open, renovate them, host programming, and more. If it had more funding, it may be able to satisfy everyone. Whether this is the best use of city funds is an important question, though one I'm afraid I'm not qualified to answer. Again, all the more reason for an educated public debate. Superficially, it is easy to imagine a case for increased NYPL funding. The Citizens Defending Libraries blog shows that NYPL lost about $40 million in annual city funding from 2009 to 2011 despite rising libraries usage. Likewise, it may make sense to consolidate libraries in a city like Detroit, with a declining population. But New York's population is at an all-time high, and it projects further growth for upcoming decades. If the CLP is ultimately driven by budget shortfalls, then perhaps the budget should be increased. Right now, the ball is in the hands of the New York City Council and Mayor Bill de Blasio. They can make or break the CLP by continuing to offer NYPL $150 million in city funds for implementing the plan, or by pulling the funds or redirecting them to other purposes. The New York Times reports that de Blasio is waiting for a cost analysis of the project before proceeding. de Blasio should also wait for a full public debate that can only happen when cost numbers like this become publicly available. A hearty public debate would generate new ideas, build consensus for the best plan, and demonstrate the ideal of educated democracy that public libraries represent.